Overall 3D view, open on fols. 44v-45. Secondary Inscription: Inscribed upper cover pastedown, upper outside corner, in pencil, "56". Inscribed front flyleaf, recto, upper outside corner, in pencil, "Payne"; center of page, Phillipps stencil, with the number "4204". Inscribed fol. 47v, in an eighteenth-century(?) hand, in pen, "Carte n° 49". Inscribed lower cover pastedown, outer lower corner, in pencil, "P1001 / UZZ42". Like people today, people of the medieval and Renaissance periods read how-to books. 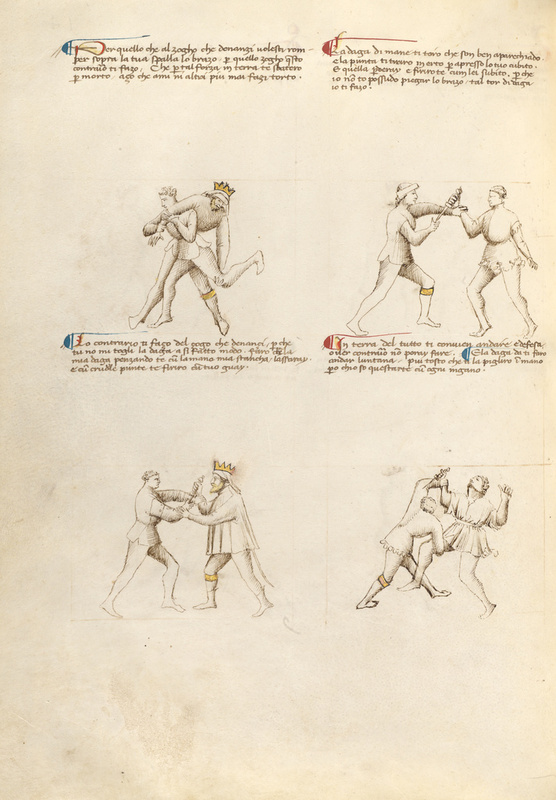 This manuscript by the greatest fencing-master of the late 1300s, Fiore Furlan dei Liberi da Premariacco, instructs the reader in the intricacies of combat. Lively illustrations of charging horses and armored knights accompany the text. 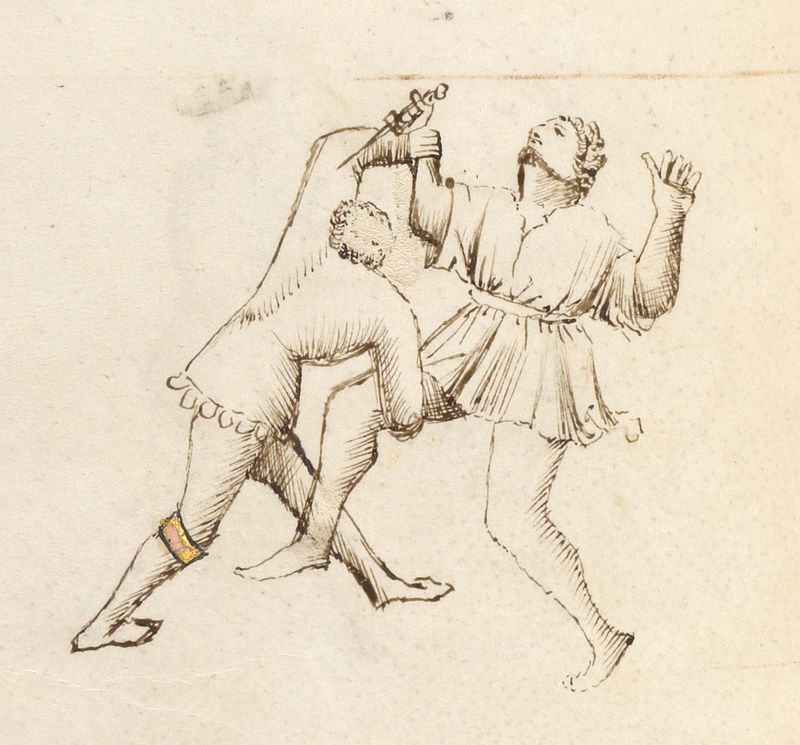 Through words and pictures, the manuscript teaches a variety of fighting techniques including single combat on foot with sword, dagger, and ax, and also mounted combat in all its variations. Nicolò III d'Este, ruler of Ferrara, ordered at least three copies of this text, including this one. 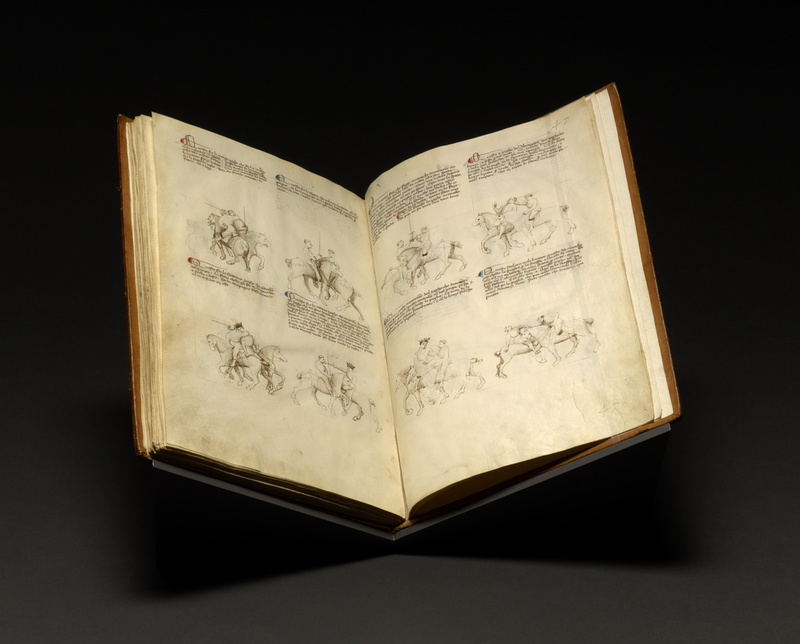 Nicolò's interest in such a manual was quite natural, since fighting played an important role in the education of young nobleman, and he himself was raising three sons. Mellini, Gian Lorenzo. "Disegni di Altichiero e della sua Scuola, 1." Critica d'arte 9, no. 51 (May-June 1962). Mellini, Gian Lorenzo. "Disegni di Altichiero e della sua Scuola, 2." Critica d'arte 9, no. 53-54 (September-October, November-December, 1962). "Manuscript Acquisitions: The Ludwig Collection." The J. Paul Getty Museum Journal 12, 1984, p. 306.
von Euw, Anton, and Joachim M. Plotzek. Die Handschriften der Sammlung Ludwig. 4 vols. (Cologne: Schnütgen-Museum, 1979-1985), vol. 4 (1985), pp. 282-88. Kren, Thomas, and Kurt Barstow. Italian Illuminated Manuscripts in the J. Paul Getty Museum (Los Angeles: J. Paul Getty Museum, 2005), pp. xiv, 33-35, ill.
Morrison, Elizabeth. Beasts: Factual & Fantastic (Los Angeles: J. Paul Getty Museum; London: The British Library, 2007), pp. 53-56, fig. 44. Eze, Anne-Marie. "Abbe Luigi Celotti (1759-1843): Connoisseur, Dealer, and Collector of Illuminated Miniatures." Ph.D. diss. (The Courtauld Institute of Art, University of London, 2010), p.108-9, p.108-9. Mondschein, Ken. The Knightly Art of Battle (Los Angeles: J. Paul Getty Museum, 2011), passim. Kren, Thomas, and Kurt Barstow. Italian Illuminated Manuscripts in the J. Paul Getty Museum. 2nd ed. (Los Angeles: The J. Paul Getty Museum, 2015), pp. xvi, 37-39, ill.